Mixed Media Participatory Installation: hand embroidery on cloth. 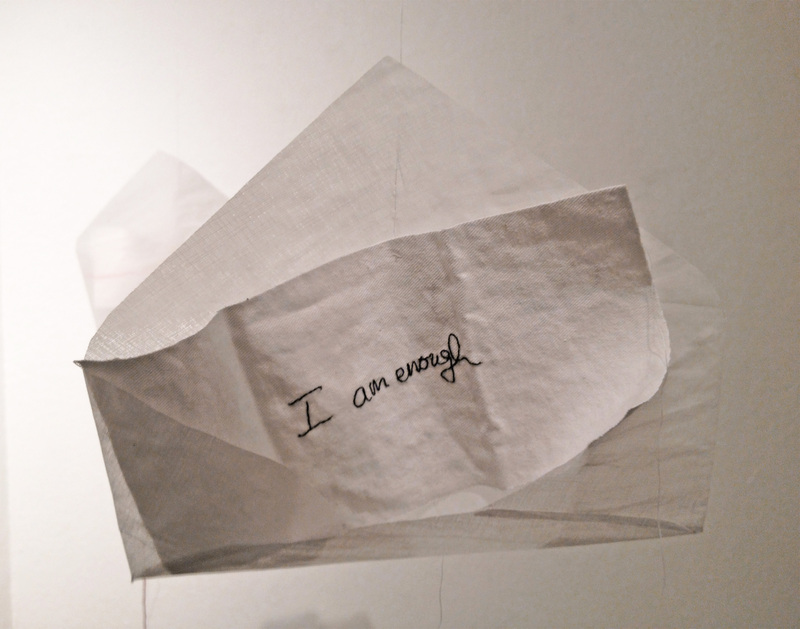 To create this piece I gave people (mostly strangers) around the country self-addressed stamped envelopes with personal questions inside and a description of the project, usually after a good conversation. They were invited to write a short response in their own handwriting and send it back to me to become part of the project (also available to those following the artist online). The artist then hand embroidered every reply received by Jan 1, 2014, matching the color and handwriting as faithfully as possible. Mixed Media Participatory Installation: machine embroidery, print on fabric, acrylic, weights. 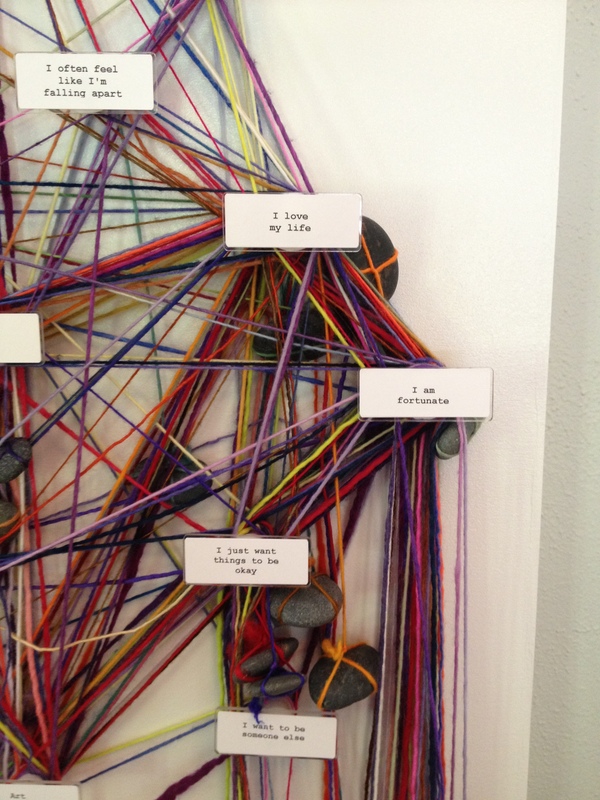 This piece includes text from the companion piece Write Me for Art/Do you read me? (Disintermediation), but also text taken by the artist from online social media. *For those of you who are unable to handle these, if you did you would notice that the ones that are machine-embroidered were heavy (about the weight of a phone or tablet, a little heavier). Those objects corresponded to the text from the first piece (Disintermediation). The others were printed rather than embroidered, were light and the text was taken from online social media. The piece in the background is Iteration #9 of Identity Tapestry. The Gala fundraiser opening for SFAI’s graduate thesis show. This photo is right when things were closing down. I liked the stillness and being able to clearly see all three pieces without the crowd. It was a really great night. I love seeing people interact with the work! I poked my head out a little, but I haven’t seen the whole show yet. I’m looking forward to a quiet viewing tomorrow. me in front of my work in the dress I designed. Heather Jones’ work- I love the way this works with the wall and the space! Done! There is more than this in the full installation (such as 40 more hand-embroidered messages), but this should give you an idea. 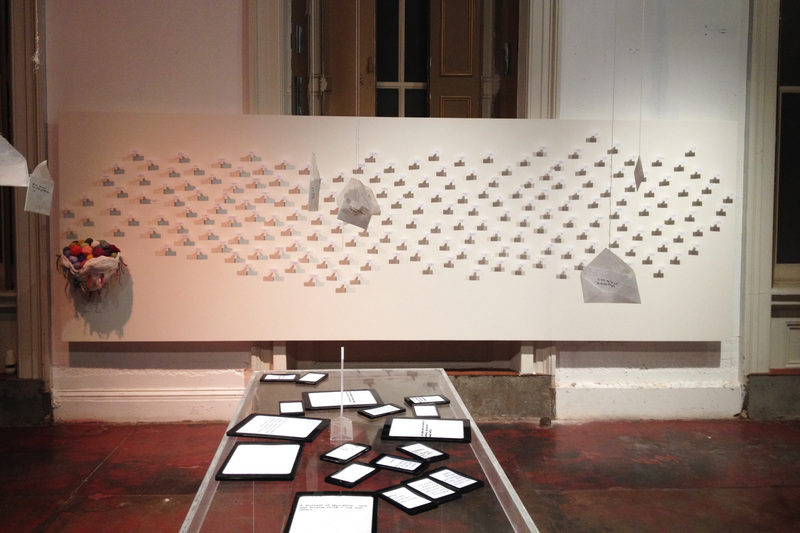 Identity Tapestry is ready to go, the table is built, the tablets together and the envelopes hung. All ready for visitors and participants.